“It would puzzle a monkey to climb that”, said the Englishman who saw this tree for the first time in a friend’s garden in Cornwall around the middle of the 19th century. The name stuck and this tree has been the Monkey Puzzle Tree ever since. With its sharp spines and triangular needles growing even on older branches, this exotic evergreen presents quite a picture and looks very different from just about anything else you can imagine. This tree was widely planted in Victorian times and big old trees are still seen around large mansions and older homes. Despite its exotic nature it makes a hardy, easy to grow tree that is sure to attract a lot of attention in your garden. The Monkey Puzzle Tree is part of a larger group of trees found chiefly in South America and it is the hardiest of the group. Scientists call it Araucaria araucana, and these Araucaria pines, as they are sometimes called, are common in Chile and Argentina. They are conifers, relatives of spruce and pine, and the Monkey Puzzle Tree is often correctly called Chilean pine. They make up an important part of the forest of the southern parts of South America and some other types, especially the Norfolk Island Pine, are grown in warmer climates, or as house plants. The Norfolk Island Pine is the only Araucaria growing naturally outside South America – it occurs on a small island off the coast of Australia. 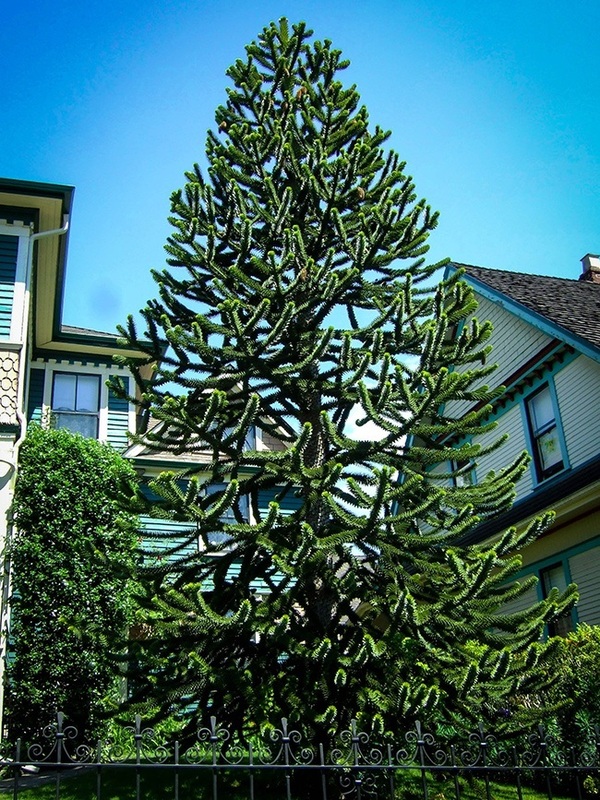 The Monkey Puzzle Tree grows into a tall, upright tree with a single trunk that can reach well over 100 feet. In time the lower branches die, especially if surrounded by other trees, leaving a long, bare trunk with a rounded, slightly pointed crown. In gardens the trees usually only grow to around 30 feet, but they can grow taller in time. Despite its height the tree remains narrow and even a tall tree is only about 20 feet across. The leaves are triangular in shape, about an inch long and an inch broad, with sharp edges and a very sharp point. The leaves live up to 15 years, so even older branches still have leaves, giving the tree a unique look. Trees over 30 years old produce cones containing edible seeds, prized for eating and called piñones. These are the only way the tree can be grown, from seed. In American this tree is hardy from zone 6 to zone 10, so it can be planted over quite a large part of the country. It will take temperatures in winter to zero degrees Fahrenheit or even a bit lower. In colder areas it can be grown as a pot-plant, bringing the pot indoors for protection during very cold spells. It can be stored in the dark for a few days, but for longer periods indoors find a sunny spot. Be careful moving it in and out, as a sudden drop in temperature can be harmful. Choose a sunny or just partially-shade location, in deep, rich soil. 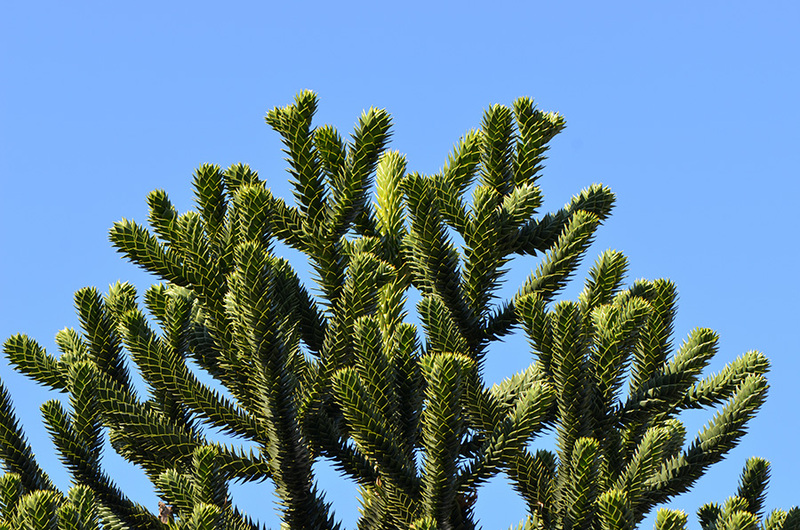 The Monkey Puzzle Tree has no pests or diseases so it is easy to grow and after a couple of years to get established your tree will start to grow one or two feet a year. Soon you will have a good-sized tree to show to your friends – they will definitely be fascinated.